One thing I love about the fall is watching my calendar fill up with activities. Yes, it certainly means that life gets busy. 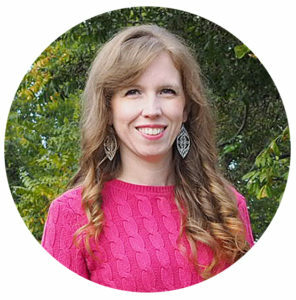 But there are ornament exchanges, holiday plays, and parties to attend. So many memories to make that go beyond the big dinner. And with multiple meals there are multiple times to bring joy. 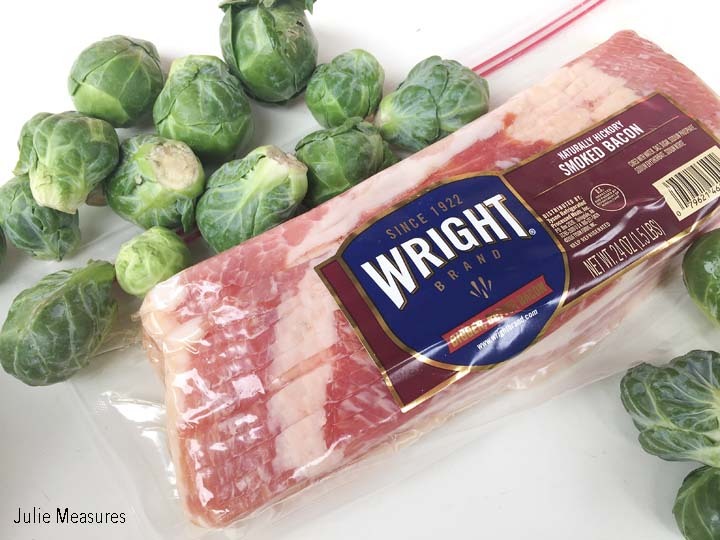 Tyson® products such as Wright® Brand Bacon are the key ingredient to recipes that can be enjoyed anytime of day during the busy holiday season. There are so many fall flavors that I love. Roasted vegetables, bacon, pecans, and maple syrup are all on that list. So this holiday season I’m making a side dish featuring all of these favorite fall flavors. 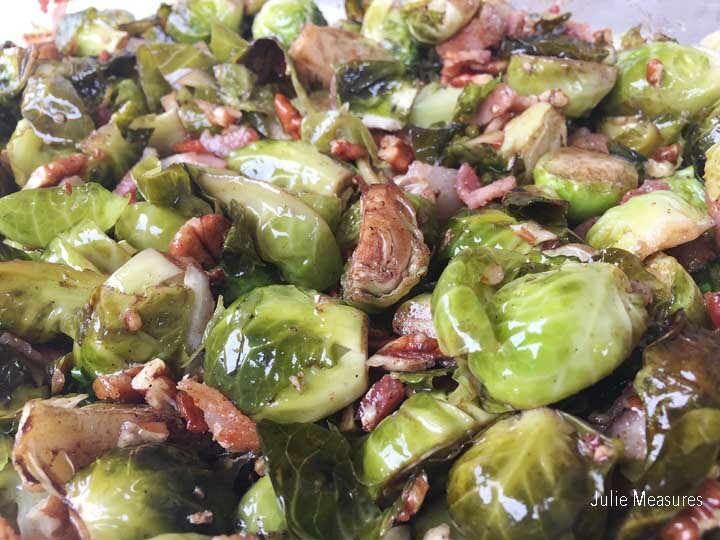 The perfect addition to informal holiday meals and gatherings, not just the big dinners, my Roasted Brussels Sprouts with Bacon, Pecans, and Maple Syrup will be a hit. You’ll find all the ingredients you need at Kroger, from the Wright® Brand Hickory Bacon to fresh brussels sprouts. Start by toasting 1/2 cup of pecans in a large skillet on the stove. Heat pecans in a dry skillet over medium heat for about 2 minutes, or until they’re golden brown and they give off a toasty fragrance. Stir or toss the pecans frequently for even toasting. Then remove the pecans to cool. After you’ve toasted the pecans you can use the same skillet to cook 6 slices of bacon. 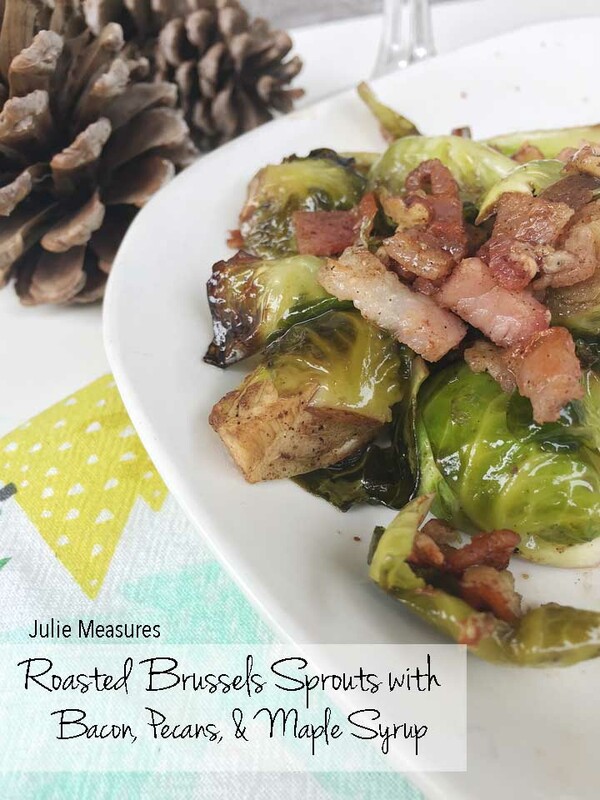 While the bacon is cooking you can preheat the oven and prep the brussels sprouts. Chop off the stem of the brussels sprouts and cut them into halves. Put the prepared brussels sprouts into a baking dish. When the bacon is done cooking, put the bacon slices on a plate with some paper towels to cool. 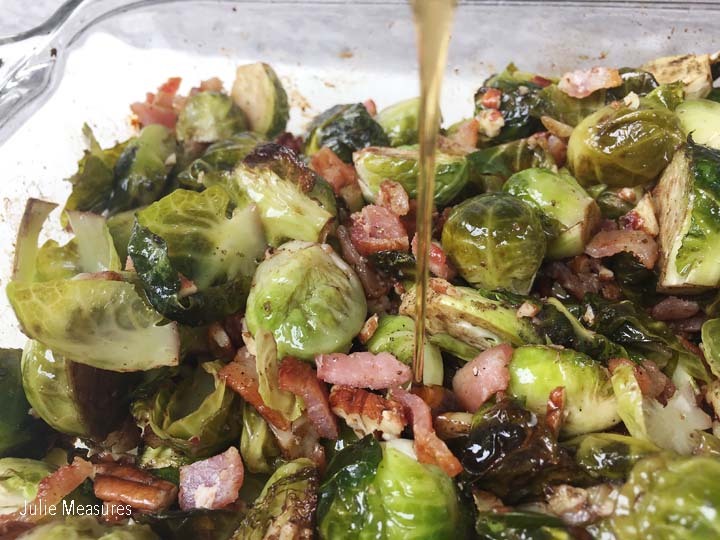 Pour the rendered bacon fat over the brussels sprouts. Also add the olive oil, balsamic vinegar, salt, and pepper. Toss the brussels sprouts to coat them evenly and place in the oven. 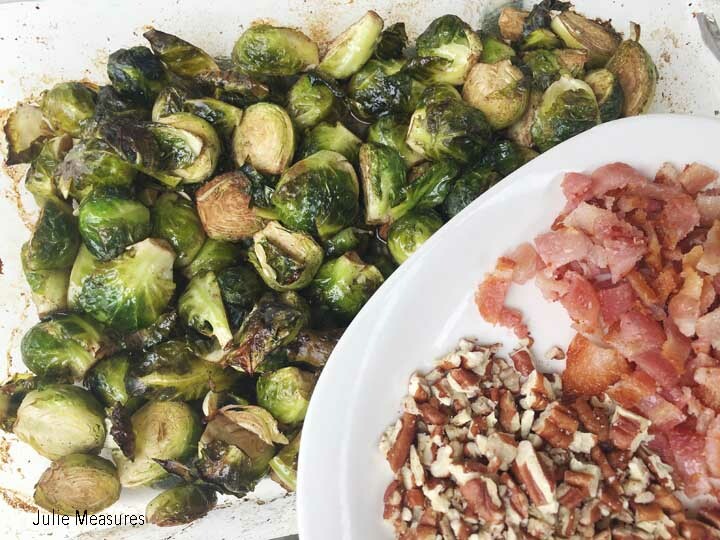 While the brussels sprouts are roasting you can chop up the bacon slices and toasted pecans. 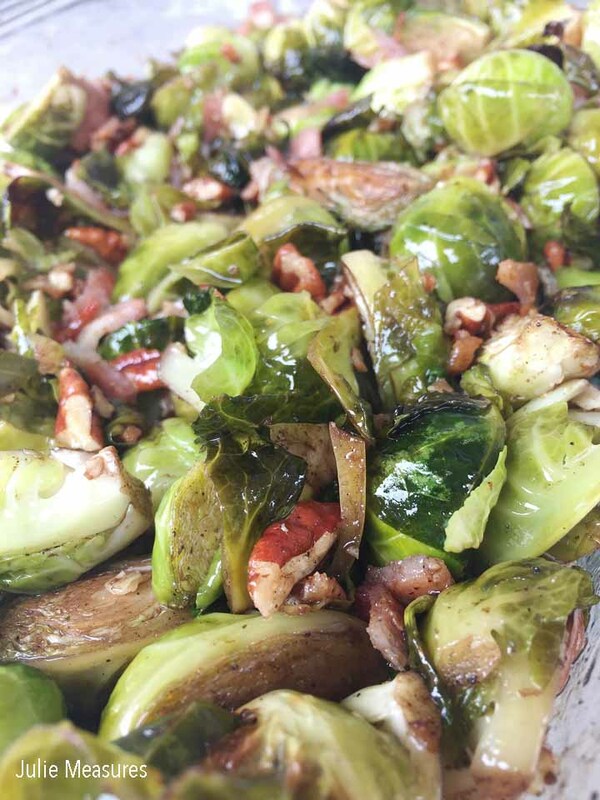 Then, when the brussels sprouts are finished, add the chopped bacon and pecans. The final ingredient is a little bit of maple syrup poured into the baking dish. This might be something you haven’t tried before, but trust me, toss the brussels sprouts to coat evenly. This holiday season, Tyson® products, including Wright® Brand Bacon, are inspiring shoppers to try something new for the table, helping transform the functional dishes hosts can make, bring or pass on as a gift. And if you aren’t hosting a meal at your home this year, this would be a terrific side dish to bring along. As a host I love it when guests show up with a dish to share, because the more food the merrier. Tyson® products, like Wright® Brand Bacon, are perfect for all cooking occasions and all holiday season long. What new Tyson® dish are you trying this holiday season? Toast pecans in large skillet over medium heat for 2 minutes. Remove from heat to cool. Cook 6 slices of bacon in large skillet. Transfer bacon to a plate lined with paper towels to cool. Chop brussels sprouts in half and place in a baking dish. Pour rendered bacon fat over brussels sprouts. 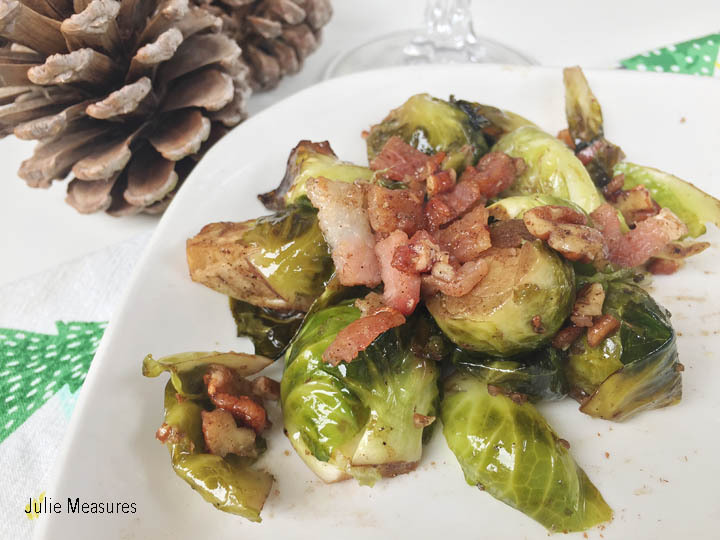 Toss the brussels sprouts with bacon fat, olive oil, balsamic vinegar, salt, and black pepper. Roast for 20 minutes, until brussels sprouts are tender and caramelized, stirring halfway through. 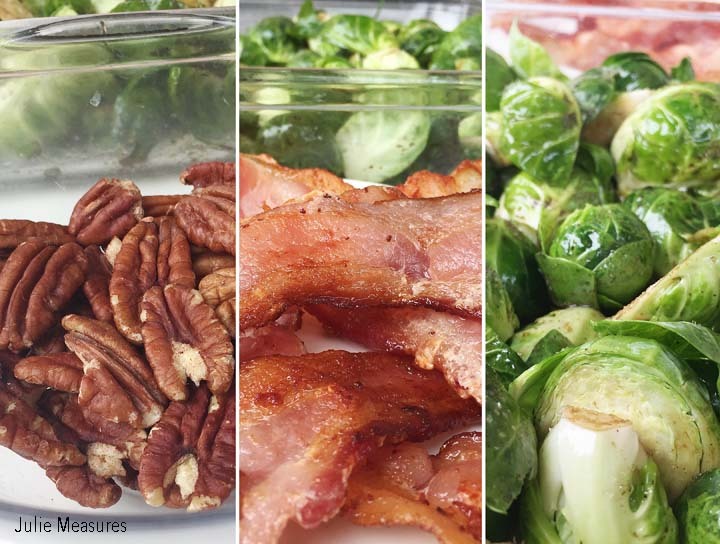 Add chopped bacon, pecans, and maple syrup to roasted brussels sprouts. Toss to coat evenly.